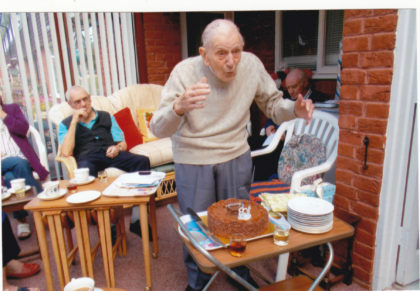 One of our leaseholders celebrates his 103rd birthday! One of our leaseholders born the year the First World War broke out has celebrated his 103rd birthday. Mr Harrison rose to local fame as a champion swimmer, marked the occasion with a coffee morning and cake at his home at one of our estates on July 25th, with the help of fellow residents and staff. Mr Harrison was born in Farnborough and went to school locally. It was while he was on his way home from school one day that his talents as a swimmer emerged. “When I was five years old, on the way home from school we came past an old Army horse pond,” he said. And that talent took him to great heights: having taken up competitive swimming at the age of 78, he made history in January 2014 when he broke the short course 50m backstroke world record for the 100-104 age group by 15 seconds, with a time of 1min 29.78sec, as well as setting a new British and European best in the 100m freestyle in November of that year. He was named Sports Personality of the year at the 2014 Sport Godalming Awards in recognition of his achievements in the pool. Mr Harrison served with the Royal Navy during the war, and was injured in an explosion while serving aboard HMS Belfast off the Scottish coast injuries which later saw him invalided out of the Navy. He says his recovery from his injuries, both physical and psychological, was helped by playing the piano: he is a talented classical pianist. Married to his late wife, Doris, for 74 years, Mr Harrison says his piano playing impressed her at the start. Having met Doris at Whale Island, near Portsmouth, he later took Doris home to meet his parents. “We had Sunday lunch,” he recalled. The couple spent six years in Nigeria before returning to the UK, where their daughter, Coral, was born. And Mr Harrison’s secret of such a long and active life?